Meas Sam Eath lives in a small village in northwestern Cambodia. 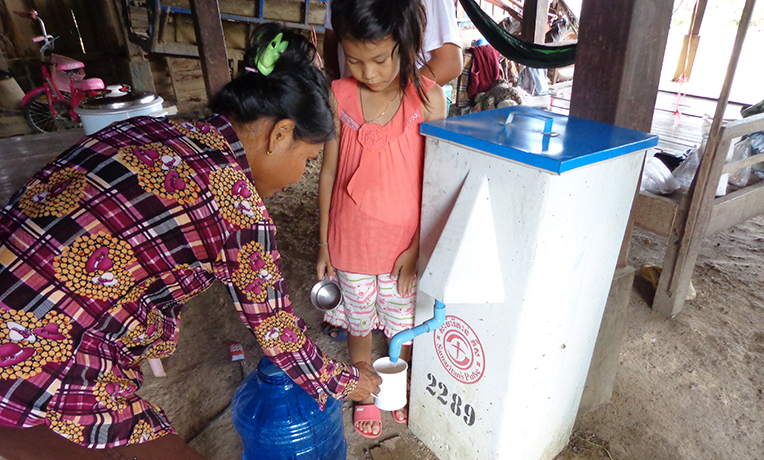 Samaritan’s Purse recently gave BioSand filters to several members of his community. I had never thought about whether the water I was drinking was clean. I always drank rainwater during the rainy season, and once it was dry, I drank from the pond. One day my village leader told me that Samaritan’s Purse was contributing BioSand filters in our village, and I didn’t hesitate to register to get one. After one week of participating in hygiene training, I really understood the importance of the filter for my family. It sifts water through sand and gravel to remove contaminates. A few weeks ago, I received the filter, and I started to use it. Since I have been using it, our health has been good, and we haven’t had any sickness or diarrhea. I used to spend 500,000 Riel (about $122) every month for treatment for these sicknesses, but now I can save it. I would like to say thanks to Samaritan’s Purse for teaching us about and providing us with clean water. Household Water Filters Samaritan's Purse provides families with an easy-to-use filter that requires no power or chemicals and can make contaminated water safe to drink for years to come. An estimated 842,000 people die each year from diseases caused by unclean water, inadequate sanitation, and poor hygiene habits. The majority of these are children in developing countries. Providing clean water, coupled with health and hygiene education, is perhaps the most effective measure we can take in preventing infectious disease. Samaritan's Purse works around the world to provide clean water and promote safe hygiene practices.